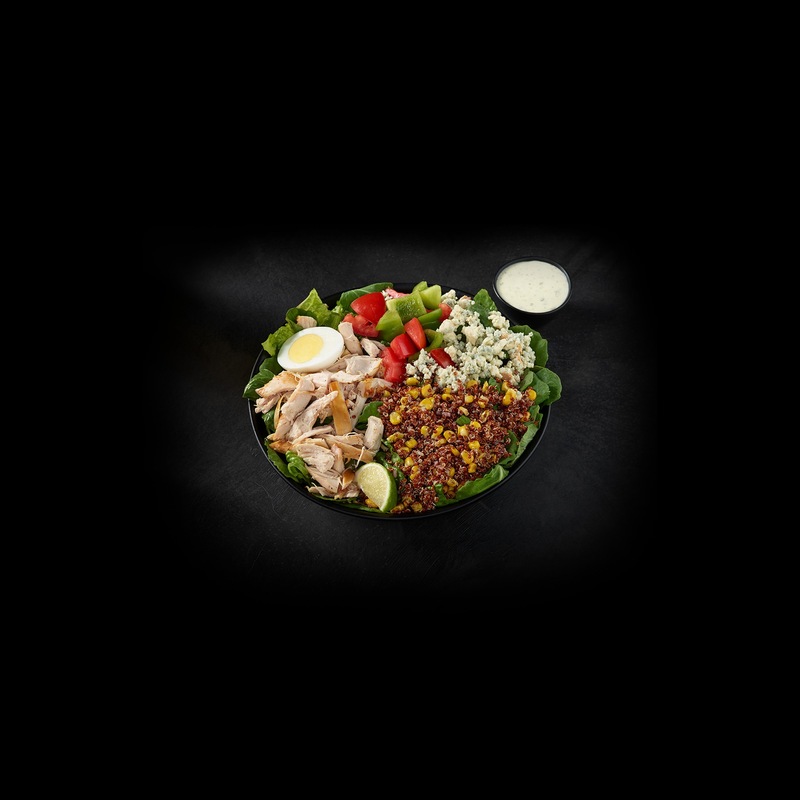 The classic American Cobb (with shredded turkey, smoked blue cheese and a hardboiled egg) gets a Latin-flavored makeover. We've added fresh green peppers, diced tomatoes, roasted corn and quinoa salad, creamy avocado cilantro and Greek yogurt dressing, and finished it with a squeeze of fresh lime. lettuce, tomatoes, seasoned white turkey meat (white turkey meat, water, vinegar, salt, garlic juice, soybean oil, onion juice, seasoning [chicken broth powder, chicken powder, onion powder, natural flavor], black pepper), dressing (non-fat greek yogurt (cultured skim milk, milk protein concentrate, corn starch, tapioca starch, carrageenan, locust bean gum), water, canola oil, avocado, cotija cheese (milk, salt, culture, enzymes), distilled vinegar, buttermilk powder, poblano chiles, pumpkin seed, salt, dried garlic, red wine vinegar, sugar, cilantro, xanthan gum, spices, citric acid, natural flavors), kale, cooked quinoa (water, quinoa), hard cooked eggs, fire grilled corn (super sweet corn, oil [olive oil, canola oil]), smoked blue cheese (cultured pasteurized milk, salt, enzymes, penicillium roquefort), potato starch (to prevent caking), peppers, limes, sea salt.